Kold Flo | Alpine Products, Inc.
Kold Flo is an asphalt emulsion based material modified with latex, additives and fillers and can be used on asphalt or concrete pavement. NO! Kold Flo is ready-to-use right from the container. (If settling occurs from prolonged storage, nominal mixing may be necessary). What size containers is Kold Flo available in? 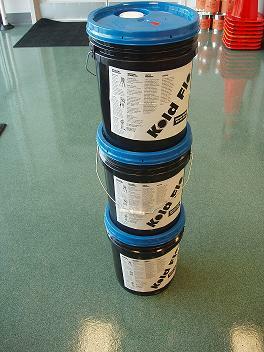 Kold Flo is packaged in 1 gallon bottles, 5-gallon pails and 55-gallon drums. At what temperature can Kold Flo be applied? Kold Flo can be applied when the ambient temperature is at least 50 degrees F. It is best to crack fill in early spring or late fall, when the pavement cracks are near their widest point. Is Kold Flo affected by freezing temperatures? YES! Freezing temperatures will destroy Kold Flo during storage or within 24 hours of application. What size cracks can be filled with Kold Flo? Kold Flo is designed to penetrate into cracks ranging from 1/4″ to 1″ width and depth. The larger cracks may require a second applications due to water evaporation during the curing process. Volume shrinkage of material in the crack may occur. Does sand need to be added after application? NO! Kold Flo will surface cure between 15 to 30 minutes after application allowing for quick traffic access. Extreme cases of humidity may prolong curing up to 45 minutes. Kold Flo takes at least 8 hours to completely cure. Insufficient curing time (due to rain) may re-emulsify Kold Flo causing it to “wash out” of the cracks. Can Kold Flo be seal coated over? YES! We recommend allowing Kold Flo to cure for 24 hours before seal coating over. Smaller cracks may be sealed over earlier, once Kold Flo has cured. What is the shelf life of Kold Flo? 6 months minimum when stored properly.